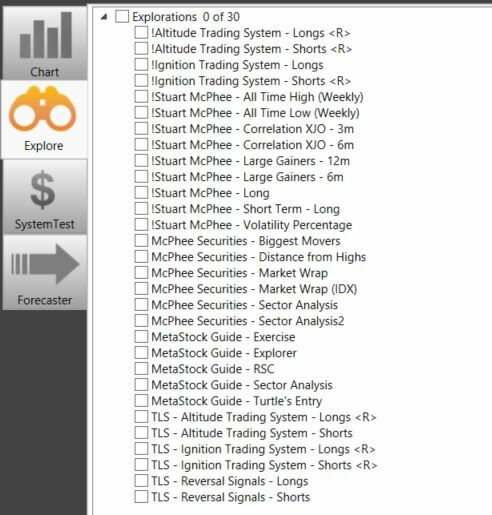 In our opinion The Explorer is the most powerful tool within MetaStock. The reason being, it allows us to perform in-depth explorations, scanning thousands of securities, to identify those securities that exhibit predefined criteria. This could involve anything from finding securities that have hit their 6 month high to those whose stochastic oscillator has moved above the 20 line, or both. It’s completely up to you. 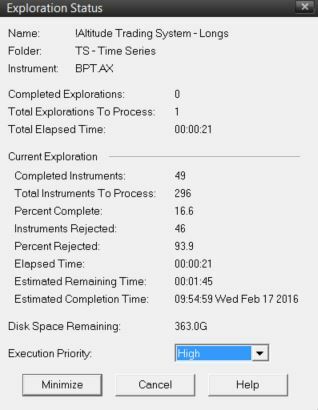 More than that, The Explorer then becomes a multi-purpose analysis tool. That is, we can use it to search, sort, and rank the information gathered. In the past, to achieve all this would be almost impossible, but now once we learn how, MetaStock can change the way we identify trading opportunities. All we need to do is merely identify what criteria we wish to search for, and choose a list of securities that we wish to filter through. Once complete, a report showing the results of the exploration, will be displayed. This dialog allows us to sort and rank these opportunities. 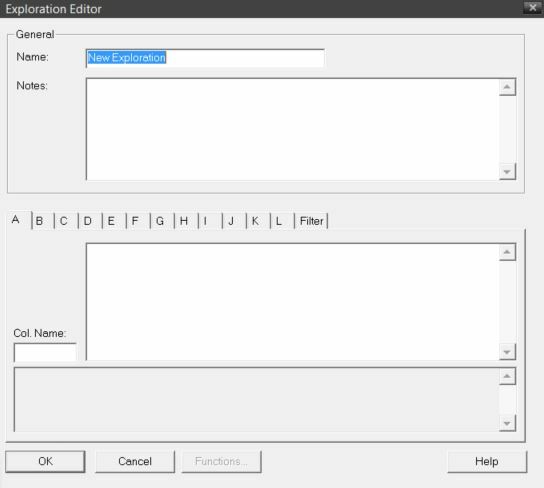 Edit: Displays the ‘Exploration Editor’ dialog of the selected exploration. This is used to alter an existing exploration. Report: Displays the reports for the selected exploration. Note: this button can’t be activated unless there is an ‘<R>’ next to the selected exploration. The ‘<R>’ signifies that a report is available from the most recent exploration. Copy: Makes a copy of the selected exploration. Delete: Deletes the selected exploration. Print: Prints the selected explorations, their names and/or formulas. Organizer: Displays the ‘Formula Organizer Wizard’. First we must enter a name for our exploration. Let’s name our exploration “My First MetaStock Explorer”. Also contained in this dialog is the ‘notes’ text box, which is optional and is used to write any descriptive notes. Below this there are 12 Column Tabs (A-L) and the Filter Tab. The Column Tabs are used to display specific values relating to the corresponding security. This will then be displayed on the reports page once the exploration is complete. For example, columns can display anything from the closing price of a security to the value of its RSI(14) from 3 days ago. The real benefit in using these columns is that they allow for securities in the report to be ranked within a column. That is to say, once we have scanned the market, we can then select a column and rank the filtered securities by that column. The Filter Tab is the principal part of our explorer. This is where we stipulate the criteria that the security must meet to be listed in the results report. Before we enter any information into the columns or the filter, we must realise that they perform separate and distinct functions. The columns display specific information regarding the securities, while the filter contains the criteria that a security must pass to make it to the reports page (this removes the unwanted securities). When entering the coding into the columns we should ask ourselves “what security specific information do we wish to know?” In our example, we may wish to know yesterday’s and today’s prices as well as the average turnover for the last 5 periods. To code the closing price within ‘Column A’ type ‘c’ into the text box. To the left of this there is another text box titled, ‘Col. Name’. Type ‘close’ into this box. (Note: Anything can be entered when naming a column as long as it is 8 characters or less). Its interpretation is such that the average price multiplied by the average volume over the last 5 periods. This could be named ‘Avg T/O’. If you have any other criteria that you’d wish to rank the securities by, once they have passed through the filter, enter them into columns ‘D’ and ‘E’ and so forth. 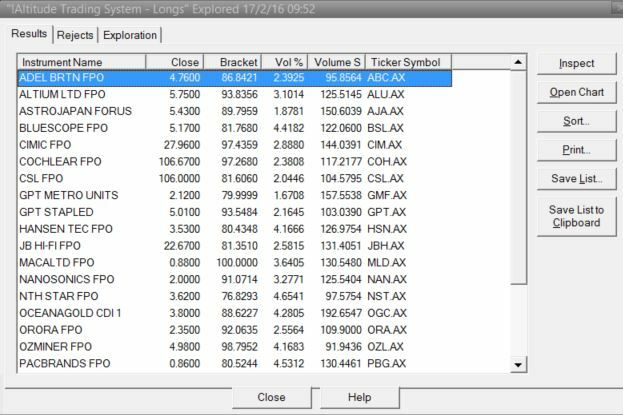 Usually, we rank securities in a similar manner, thus the column layout we just entered can be used in any explorer. Accordingly, all you have to do is change the filter section. The final tab is the Filter Tab. This is where we specify the exact criteria a security must exhibit for it to appear in the report. This stipulates that whatever value is returned in ‘Column C’, must be greater than 100,000. The result of using ‘ColC > 100000’ would be the same as writing ‘Mov(C,5,S)*Mov(V,5,S) > 100000’. As you can see this saves time and makes code easier to read if the information within the columns was quite complex. The correct syntax for referencing a column is simply ‘Col’ and then the correct column alpha value i.e. A or B or C… or F. Just remember though, this function can only be used within the Filter Tab. This formula looks for the closing price to be above 20 cents, the average turnover to be more than $100,000 and the closing price is above the 20 period simple moving average. We’re now ready to begin the exploration, so click ‘OK’ to return to the Exploration dialog. After you have selected the securities to explore in the window below, click ‘Start Exploration’. Click ‘OK’ once again, and this gets the exploration underway. The ‘Exploration Status’ window opens, giving us information about its progress. This dialog lets us know what’s going on by providing some self-explanatory statistics. This disappears after a few minutes (depending on the speed of your computer) and the ‘Exploration Completed’ dialog opens. From this dialog, we can click ‘Reports’ to gain access to our results. The ‘Results’ tab lists the securities that have been identified as fulfilling our requirements (i.e. meeting the criteria specified within the filter). The ‘Rejects’ tab lists those securities that didn’t meet the criteria. Additionally, it tells the reason for the rejection. The ‘Exploration’ tab details the exploration; this includes column formulas, the filter rules and the periodicity. Usually the latter two tabs are not reviewed at all. As a reminder, the real benefit in using the columns is that they allow for securities in the report to be ranked based on the data displayed in a column. In the Reports screen above, you can click on any column header to re-arrange the instruments listed. Click on it again to reverse that order. Inspect: Displays the historical values calculated for each column of the exploration. Open Chart: Displays the selected chart(s). Sort: Allows us to arrange securities within their column, in ascending or descending order. The simple way to do this, rather than clicking the sort button, is to simply click on the title of each column. For example, by clicking on ‘close’ (i.e. Column A) the results are sorted from lowest to highest. Click once more and they’re sorted from highest to lowest. Print: Prints out the report. Save list: Save the results; in this way we can then scan those securities with another explorer. To find the securities which met our filter criteria, we look in the ‘Results’ tab. To review these charts simply highlight them (holding the shift key and/or ctrl key to multiple select) and click ‘Open Chart’. Click ‘Close’, and ‘The Explorer’ dialog appears. Click ‘Close’ once more and now it’s time to view the charts, deciding which securities are the best trading candidates. Recieve your free copy of Stuart McPhee's book "Implementing the Trading Process" today.